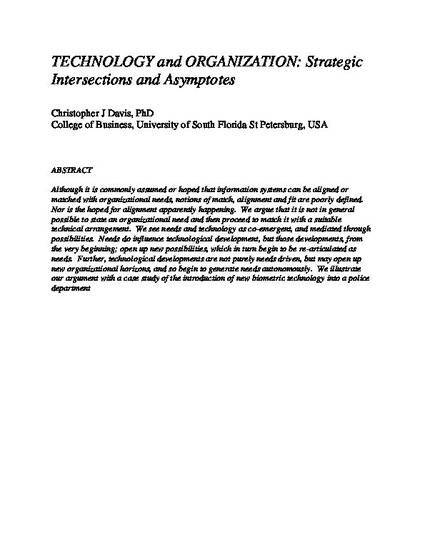 Technology and organization: Strategic intersections and asymptotes. Although it is commonly assumed or hoped that information systems can be aligned or matched with organizational needs, notions of match, alignment and fit are poorly defined. Nor is the hoped for alignment apparently happening. We argue that it is not in general possible to state an organizational need and then proceed to match it with a suitable technical arrangement. We see needs and technology as co-emergent, and mediated through possibilities. Needs do influence technological development, but those developments, from the very beginning; open up new possibilities, which in turn begin to be re-articulated as needs. Further, technological developments are not purely needs driven, but may open up new organizational horizons, and so begin to generate needs autonomously. We illustrate our argument with a case study of the introduction of new biometric technology into a police department. This is the author's version of a work that was accepted for publication in the Business Journal for Entrepreneurs. Editorial and formatting changes may have been made to this version since it was submitted for publication. The final version was published in Business Journal for Entrepreneurs, 2011(3), 118-152.